These are scaled representation wooden ship models of the HMS Victory ship docked in Portsmouth. Our HMS Victory models are built from scratch and make unique displays representing a key turning point in British history. All the ships features are replicated to the best of our ability. We present the models between varnished and painted versions to appeal to different tastes. This double planked and very detailed HMS Victory model ship has been built from scratch by our talented workers. When you purchase this model you can be sure that you are acquiring a work of art. This is a single planked HMS Victory model ship very similar to the HMS Victory docked in Portsmouth, UK. Please contact us regarding delivery cost. This HMS Victory ship model is varnished and is built with a copper pinned hull for extra strength to exposure to heat or cold. This model has one black stripe. This beautiful ship model has detailed rigging, deck, and bow. One of our best HMS Victory model ship for sale, this painted model ship is the perfect sailing present for anyone interested in the Royal Navy history. This model possesses a copper sheathed hull. It has detailed rigging, deck, bow plus pinned and planked hull. The HMS Victory is the most famous British historic period ship of all times. This wooden HMS Victory model ship is handcrafted from scratch and it is a beautiful work of art. 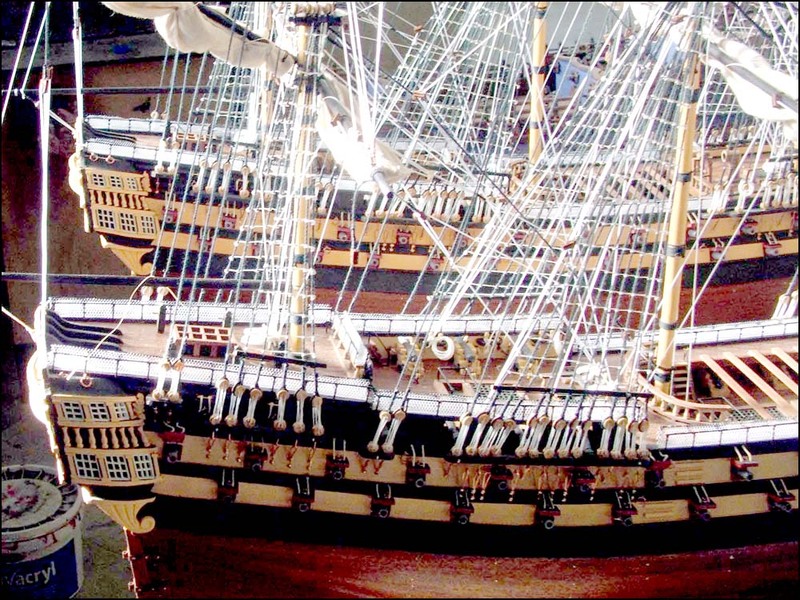 This HMS Victory model ship is skilfully painted and very detailed. The ship model is ready for display and requires no assembling. It's a unique gift for friends in the Navy.